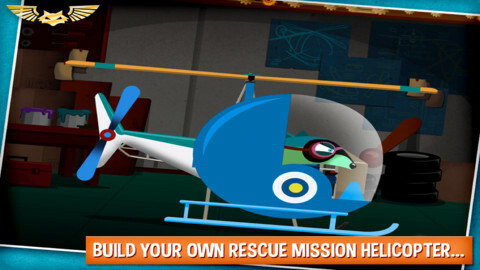 Wombi Helicopter App Review – High-Flying Fun! Usually I begin my reviews with a semi-funny anecdote that relates to the app about which I’m writing. When it came to this particular game I just couldn’t come up with anything cute that involved a raccoon piloting a rescue helicopter to pick up cows floating away with fistfuls of balloons. I’m considering myself lucky that I can’t share such a story. 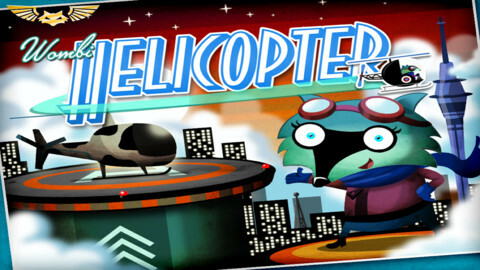 Wombi Helicopter is as much fun as it sounds from my spoiler alert. 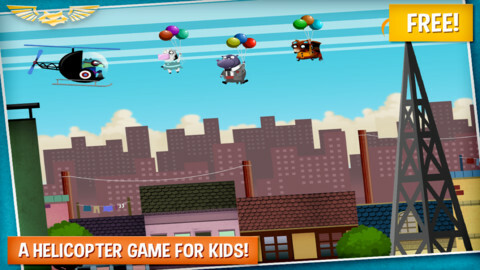 Young players choose different components to make up a custom chopper and head out into “town” to save citizens from rogue balloons. An evil skunk, the mastermind behind the Balloon Incident, is waiting in a hot-air balloon or a prop plane to send the helicopter crashing (non-violently) to the ground. Altitude can be changed by holding a finger on the screen, but take it off and the helicopter might fall out of the sky. Ol’ Stinky isn’t the only obstacle to watch out for, though. Keep an eye out for birds flying by, simply minding their own business – they can do some really damage to a ‘copter. Watch out for the roofs of buildings – they can be a big hassle. No matter how many times players may crash the helicopter, there’s still a huge celebration when the landing pad comes into view, and the raccoon at the helm (who happens to be female) is hailed as the Heroine of the Day. My daughter, who just turned 3, loves this game, but it took her a few minutes to figure out how to get the helicopter to fly without crashing. My 5-year-old son played through a level once and decided the game wasn’t for him. He told me that it wasn’t “hard enough” and informed me he was using the computer, which is apparently what all the cool preschoolers are doing this year. We have reviewed two other Wombi apps and loved them both; Wombi Helicopter is no exception. Aside from the somewhat limited age range, this is a great preschool app. It’s a free download so there’s no buyer’s remorse if your little one is a picky player. Your little one can hop in the pilot seat with this fun, free app!